Inspiring champions of the heart is the essence of Veronica Karaman's life and the reason why she has become a popular speaker, teacher, motivator, and author. At the age of five, Veronica began her golf career and her quest to become a champion. 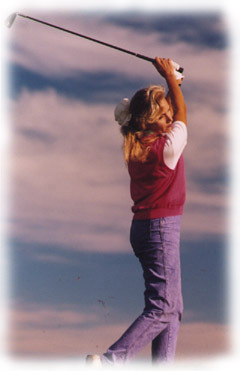 At this early age, as her father placed a putter in her hand, she knew that golf would become her closest friend. She found out later in life that golf would also become her worst enemy when she failed. Success in golf, achieving all A's in academics, and striving for perfection, were all things that she worked diligently at accomplishing. She graduated as the valedictorian of her high school and graduate school classes, and won many golf tournaments. However, all the trophies and triumphs were not enough to fill the void and the loneliness in her heart. Her father's death when she was fifteen only fueled Veronica's determined pursuit to become a champion. At the height of her college career as a scholarship athlete at Duke University, she realized that being a champion is not a trophy you achieve, but an identity you receive in Christ. She also discovered the tools of a true champion were the tools of the Master Carpenter, Jesus Christ. Those tools were unconditional love, acceptance, and dignity of soul. Veronica found Jesus Christ and accepted Him as her Lord and Savior. This discovery helped set her free and let Christ create the true champion in her. After five years of quitting golf, He led her to her career highlight. After winning the qualifying tournament, Veronica went on to play in the 1989 Women's U.S. Open. As a result of a biblical revelation of championship, Veronica realized that God was calling her to share her experiences and to help other captives become true champions themselves, on the course, in the classroom, and in life.